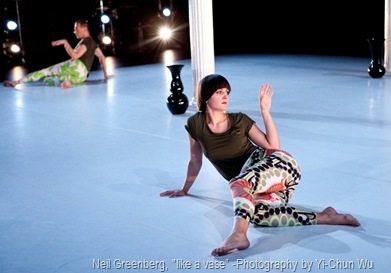 You are here: Home / iDANZ Critix Corner -Dance Reviews / Dance Review: Neil Greenberg – Saggy-Crotch Tights are the Cats Pajamas! By George—or better yet, by Merce—Neil Greenberg’s got good design; this former Cunningham dancer not only knows how to make a fashion statement, but also how to make statement, a fashion. His past works have made quite the mark, inviting audience members to question status-quo gender roles, ponder common assumptions about HIV/AIDS, and interrogate what society associates with homosexuality. And now, his latest work, (like a vase), continues the expedition into the social-norm jungle. “Ladies, line-up” Ruth continues. And Durango assumes a pose on relevé, hands behind back and elbows bent… like the wings of an exotic bird. (well with plumage like that of her loud, patterned tights, she’d have to be exotic!) Perhaps some abstract ode to Barbie? Or…as Ruth gabs on and on about poise, Durango starts strutting around with delicate, toe-pointed steps; she circles the column-confined area, and I feel as though I’m watching a peacock parading round its pen at the zoo. Neil Greenberg, who by this point has furtively entered and placed one vase at each column’s base, begins clapping. It’s not, by any means, directed at Durango, but because of her spatial arrangement, the model strut she just gave, and what transpired in the narrative, I connect the dots, and interpret that he is, indeed, applauding her. 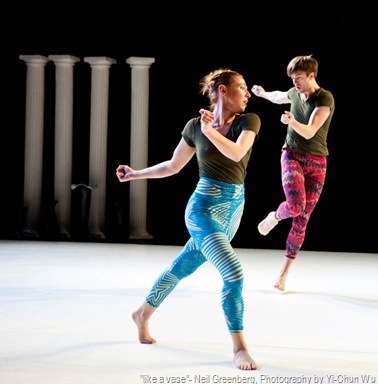 Here’s the unique thing about Neil Greenberg’s choreography: many of the goings on—the score, the dancers, the set, the musicians—have the strength to operate independently from one another. But when they do sync-up coincidentally, they suddenly seem intentional… and then there’s meaning in them thar hills! So although Neil’s clapping at that exact moment may seem intentional in relation to Durango, as the piece goes on, clapping returns in other moments as part of the phrasing, and by contrast we see there may be no meaning at all: it’s just a neutral gesture. How about a dancer taking a sip of coffee, followed by a sip of water off-stage? It appears to be a pedestrian gesture of no meaning. But take the same movement, and have two dancers do it in unison, and suddenly, I notice myself trying to “figure it out”. This is Neil’s other obsession, which now has become mine too: “tensions created by the seemingly inescapable human desire to create meaning.” The eccentric movements may coincide with the score, and by default, I can’t help but draw a connection for them. Ruth says “swing your weight forward” and the dancers do swinging movements with their arms. 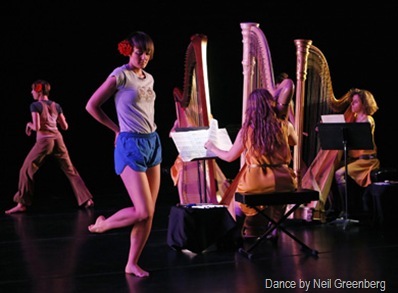 As musicians, Zeena Parkins and Shayna Dunkelman, tune up the harp and other instruments, the text speaks of using one’s breath like a “musical instrument.” Another cue, via the text: Ruth is “prancing through the forest” with the hypothetical fat girls she is coaching. Greenberg and Luke Miller are prancing about the space too… in the most laugh-out-loud-funny way! And later, Paige Martin’s vibrating palms begin as a move all-their-own; but once paired with the echoing sound of the harp, it looks as though she is struggling to cage the sound between her two hands. I am tickled by my ability to connect the dots and create meaning. We all are… everyone giggles with delight at the sight of two dancers sipping coffee in unison. We all love to feel like we “get it.” But we also love to be challenged. Several times throughout the show, a dancer brings a microphone stand on-stage, taps and blows into the mike, but says nothing. Hmmm…what does that mean? I question. Similarly, a move may be repeated several times throughout the show, but in different contexts; the audience is prompted to question why they felt a certain way about it the first time, and differently the second. I watch Mina Nishimura introduce a head tapping solo far upstage left, behind the musicians, and partially obstructed by the light booms. She is clearly lit, so I am clearly drawn to watch her, and yet this is the first time I give my full attention to a dancer who is not dancing on the white marley, “pedestal” stage. Shortly after, Collin Stillwell does this same movement on stage, and I wonder: is it the status-quo to label movement on the marley as “dance,” and movement off the marley as “not dance?” Does placement determine what something is and isn’t? The exquisiteness of Greenberg’s work is his ability to provoke such philosophical battles. Also noteworthy is his ability to give dimension: the simplicity of his movements, the repetition, the sparseness on stage alternated craftily with crowdedness…also the sparseness in the score alternated with lushness. There is time for movement, and time to digest. Repetition occurs, and we reflect once more; contemplate and re-contemplate. The openness of his dance score allows audience members time and space to think… feel… and ponder….. all while experiencing something truly beautiful! What a wonderful gift! A cornucopia of beauty, in fact, besides the dancing, there’s a beautiful set to behold! Four black vases are lined up in a row: their stark silhouettes in contrast to the white marley floor. Also prominent are four white columns, arranged in a square, and a giant turquoise harp upstage. This scene harkens to Greco/Roman classical art…a Michelangelo painting perhaps. The harp is obviously functional: also creating beauty for the ears to hear, thanks to the ingenious musings of harpist and composer Zeena Williams. In this city where time and space are hot commodities, I rejoice in the moments of inserted breathing time to bring notice to all elements…. even the musicians themselves. For example, there is a long instance where no dancers are on stage—just the musicians playing their instruments—and I am perfectly content watching them do their thang! The openness of Greenberg’s dance score lends itself to be pondered, questioned… and personalized to tastes of the individuals watching it. My neighbor may see one way, and I another. Neil’s work doesn’t limit itself to one definition, and that’s part of the gift as well. Greenberg’s passion for artistic statement is strong… but even stronger is his passion for the audience. He makes his work accessible, choosing to include the public on his exploration of social norms, as opposed to alienating them with high-brow airs. How considerate and generous! (like a Vase) is really like a gift: an hour of pure, thought-provoking stage play, handed to the New York public like a delicately wrapped piece of ceramic art. So little pilgrims, the thanks-giving season is upon us; and now is as good a time as any to remind ourselves the importance of thank you notes. You may not have liked those pajamas Aunt Millie gave you last year, but you will definitely like Neil Greenberg’s multicolored, psychedelic saggy-crotch tights!… and even more so, his work (like a vase). It is a masterfully crafted gem, certainly worthy of the pedestal he puts it on for all to enjoy. Please thank him by seeing this show!